John Muir said, “When one tugs at a single thing in nature, he finds it attached to the rest of the world.” So is the case for each walk-inspired essay from Katherine Hauswirth. Each reflection hands you talismans that you can turn over thoughtfully in your palm. Hauswirth’s meditative reveries reflect on the deep connections between what we experience outdoors and our day-to-day existence as humans, peppered with thought-provoking facts as well as treasured words from other lovers of the natural world. This book by powerful author Katherine Hauswirth is actually my religion. I don’t mean that I just revere and respect the interdependent web of life she explores, I mean that I worship it. Her flowing words about thousands of threads in the tapestry of Mother Nature (that we might otherwise overlook or take for granted) are my idea of spiritual catharsis. My favorite chapter is We Could Be Heroes and not just because I sometimes admit to a small hero obsession. She points out aspects of the climate crisis that is indeed my large obsession because the future of humanity is at stake. We are at the crossroads and I want to be quite hopeful as she is ‘as our beloved Earth and its many fragile species inches slowly back from the brink of disaster.’ To me, in other words, this book is manifestly the meaning of life itself. 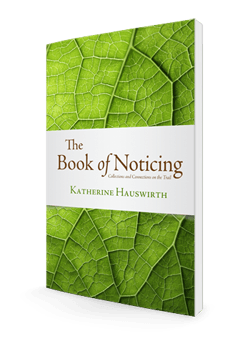 In The Book of Noticing, nature writer Katherine Hauswirth takes us along on her regular walks, sojourns conducted for the primary purpose, as the title suggests, of noticing what lies along the way. It is a lengthy and varied list; salamanders, scents, science, spirituality, slugs and more, all recorded with an astonishing level of detail. Research tells us that humans benefit from spending time in nature. For those places and times we simply can’t get close to it ourselves, Hauswirth’s careful and sometimes lyrical descriptions serve as a vicarious substitute. Those who want more will appreciate the extensive bibliography. —Melissa Gaskill, nature and science writer and author of Worldwide Travel Guide to Sea Turtles and Best Hikes with Dogs: Texas Hill Country and Gulf Coast. Katherine Hauswirth has come home from her walks through the woods with little drops of serenity and wonder. Now those collections, pooled together in this book, are deep enough to immerse readers. —Nathanael Johnson, Author of Unseen City and Grist staff writer. Katherine Hauswirth’s Book of Noticing rings and echoes with her love and longing for the natural world. Like the bobbing tentacles of slugs she describes, these insightful meditations vibrate at the frequency of change. 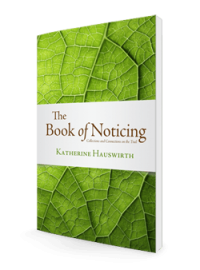 Katherine Hauswirth’s Book of Noticing reminds us all of the value of attending closely to our natural surroundings. Katherine’s stories regarding the permeability of slugs, the job-shifting of ants and other particular observations are more than just informative, they are personal and profound. They raise questions about our personal relationships with the natural world. 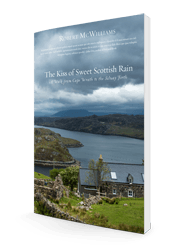 In each chapter, Katherine takes us with her on her walks and brings us into her mind, her heart and her family as she explores the smallest of creatures, seeks answers to the simplest yet most complex questions, and shares both her own and her son’s deep love of the natural world. 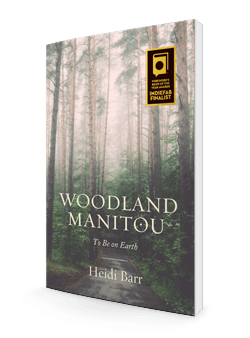 This book comes at a time when humanity’s relationship with the natural environment can either save or destroy our planet. It all begins with noticing. The Book of Noticing is a book to pick up when you’re weary, at the end of a difficult day, a day when the human storms have battered and bruised. It’s also a book to pick up at the beginning of a new day, when you want to live the day, every moment of it, to the fullest. It is a book that encourages us to observe, to experience and to appreciate the everyday things of life that are really the most important things of all. Hiding in the pages of The Book of Noticing are footprints, those left by the “small, persistent lives that mostly endeavor to hide from us” in the woods and waterways near Deep River, Connecticut. Katherine Hauswirth is not chasing them for clues to life’s burdensome mysteries, although she uncovers a few of these. She lets their presence inform quiet meditation, honoring a fleeting beauty that so many of us miss. We meet Molly and Gavin—a dog and a boy—as well as naturalists, gurus and scientists who have filled Hauswirth’s bookshelves and informed her sensibilities on the trail. She senses with the acuity of a puppy and the curiosity of a child, and she beckons her readers through myriad standpoints—under the caked dirt of an upturned tree and in frog-happy vernal pools, beneath a salamander’s new feet, through a fern’s whispering fronds and a spruce’s clustered needles. 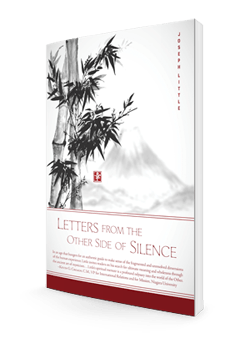 The strength of this collection of trail vignettes is Hauswirth’s clear and friendly contemplative voice. I want to walk with her again soon, now that I have inherited her gift of noticing, as all readers who take up these pages will. Katherine Hauswirth’s The Book of Noticing: Collections and Connections on the Trail is the perfect antidote for this era of distraction. Hauswirth is the most precious walking companion, sharing moments of her life as a spouse, daughter, friend, mother and, especially, avid reader, though her own experiences remain a small thread in the larger narrative of getting to know one’s local natural community. Whether her subject is newts, slugs, ferns, her love of walking in wet weather, or how we can all become citizen scientists, monitoring the threatened and endangered species and fragile habitats in our own communities, Hauswirth’s book reminds us that the first step in preserving the planet and our own well-being is simple observation. We must, as she does so well in these pristine essays, take notice. Deep River resident and author Katherine Hauswirth has written a remarkable collection of essays, The Book of Noticing: Collections and Connections on the Trail. Hauswirth’s nature writing arises largely from long walks in Connecticut, and her observations demonstrate a spry curiosity and eloquent appreciation for our natural world. She guides the reader through her beloved landscapes with a steady hand.